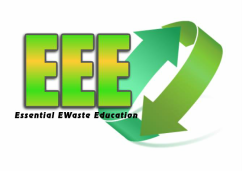 The Essential EWaste Education resources contained on this website are designed for use with students in grades K-12. The purpose of these resources is to provide background information, lessons, and activities about EWaste (electronic waste) for teachers to use with students. The purpose of this education resource manual is to provide teachers relevant lessons and activities about EWaste (electronic waste). Students will learn what EWaste is, where EWaste goes after its use, and the hazards EWaste pose to humans. Close your eyes and picture the images of over-flowing landfills. Do you see mounds of trash bags, used diapers, tons of discarded restaurant food with seagulls swarming overhead? In addition to those items, landfills are also over-flowing with discarded, out-of-date electronic waste (EWaste). Discarded electronic products such as appliances, televisions, cell phones, and computers are considered EWaste (Eiselen, 2012; Zhang, Schoor, & Zeng, 2012). EWaste is the fastest growing type of debris generated in developed countries like the United States due to the large number of people who own electronic devices and the rate at which those devices become obsolete (Eiselen, 2012; Zhang et al., 2012). Loss of natural resources, the toxic materials that cause harm to the environment, and the amount of EWaste that is generated each year are the primary concerns related to EWaste (Zhang et al., 2012; Zhang & Wakkary, 2011). Resources like copper, aluminum and, gold can be mined from discarded EWaste, and then can be recycled or reused (Zhang et al., 2012; Zhang & Wakkary, 2011). When EWaste is improperly dismantled, pollutants like lead and mercury are released from the electronic waste; which can harm the health and environment of the people handling those materials (Eiselen, 2012; Kim & Paulos, 2011; Zhang & Wakkary, 2011). Developing countries like India and China, the main destinations of EWaste, have reported increases in adverse environmental and health conditions due to improper EWaste recycling practices (Eiselen, 2012). Developed countries like the United States and Japan export EWaste to developing countries because it is a cheaper alternative than providing recycling and proper disposal domestically (Eiselen, 2012). Kim and Paulos (2011) reported most EWaste is not recycled but instead is kept in storage at companies, schools, or homes where they were once used. Therefore, Triple E consultants have designed educational materials for teachers to use with students to educate them about the harmful effects and the proper disposal of EWaste in order to increase recycling and proper disposal of EWaste. Click the buttons above to download the 2013 AECT PacifiCorp Problem Statement, the Essential EWaste Education Consultants' Final Proposal, and the EWaste Education Resource Manual. Read about Holly and Megan's experience with the AECT PacifiCorp Design and Development Competition in the January/February 2015 Graduate Member Musings Column of TechTrends. Eiselen, S. (2012). E-Waste. In J. Liu, S. Pellissery, & J. Campbell (Eds. ), Berkshire Encyclopedia of Sustainability (Vol. 7, pp. 86-91). Great Barrington, MA: Berkshire Publishing Group. Kim, S., & Paulos, E. (2011, May). Practices in the creative reuse of e-waste. Proceedings of the International Conference on Human Factors in Computing Systems Vancouver, BC, Canada. Rohmer, H. (2009). Recycling electronic waste. In H. Rohmer (Ed. ), Heroes of the environment: True stories of people who are helping to protect our planet (pp. 58-66). San Francisco, CA: Chronicle Books, LLC. Zhang, X., & Wakkary, R. (2011, June). Design analysis: Understanding e-waste recycling by Generation Y. Paper presented at the Conference on Designing Pleasurable Products and Interfaces Milano, Italy.